The Dollard is a special estuarine area in the Wadden Sea Region. This brackish water tidal area combines beautiful nature with a rich history of disappeared monasteries and villages. This area is a real challenge for a hiking tour. As a consequence of the large tidal difference, the flow in the tidal creeks is strong and these are often deep with steep eroded walls. Moreover, the heavy sedimentation makes hiking strenuous since you sink into the mud with every step. It feels as if you are walking on ‘drain suckers’. Thus, a good physical condition is mandatory. The Heringsplaat is located in the western part of the Dollard. 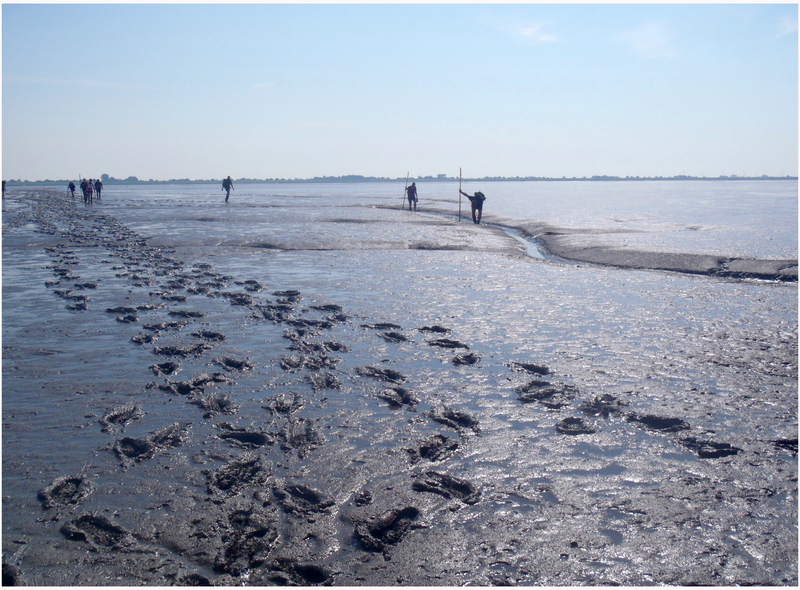 From the starting point in the Carel Coenraad polder we walk through a beautiful salt marsh to the mudflats of the Hooge Plaat. Due to the heavy mud here it takes half an hour of toil to arrive at the Heringsplaat. After crossing a creek, the trip further on is somewhat easier. According to the hydrographic map for shipping, the Heringsplaat is an island that stays dry at average high tide. However, this does not appear to be the case anymore and we only find 3 small fields of common cord-grass (Spartina Anglica). At the Heringsplaat you are in the center of the Dollard area with a beautiful view of Delfzijl and Punt van Reide towards the West, the German town of Emden North of us, the German coast in the East and Nieuwe Statenzijl and the tower of Finsterwolde South of us. The Heringplaat return hiking tour takes about 4 hours and is only suitable for real sports enthusiasts. See for another Dollard trip (to an historical German-Dutch border marker) "Coastal Tours" and "Winter Tours"Tours by appointment for at least 6 participants: date and time after consultation at aanvraag@vrijewadlopers.nl .